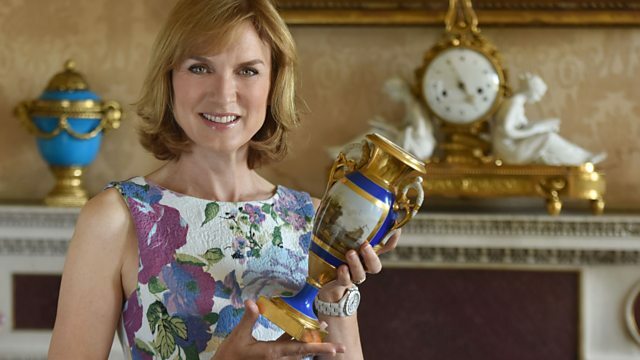 Fiona Bruce and the team head for the beautiful gardens of Trelissick near Truro in Cornwall. Objects include a bust of Churchill, a group of medals and a lifebelt. Browse content similar to Trelissick 1. Check below for episodes and series from the same categories and more! to a destination that lies along the banks of the River Fal in Cornwall. is the perfect way to come across the water. And this route forms part of the Pilgrims' Way. That way, travellers went to Glastonbury in Somerset. to our idyllic venue for today's Antiques Roadshow. to Trelissick House and Gardens here in Cornwall. but, more recently, in fine porcelain. but lived at Trelissick, a house with an extraordinary view. recently, so the bit of wear and tear you see now is how it came. before they've been rather grandly reupholstered. you might notice the rather warped banister rail. the wallpaper and paint are peeling from the walls and ceiling. There's quite a bit to do. The whole place is ready for a country house makeover. I wouldn't mind having a go! you can just make out the port of Falmouth. will bring our visitors all the way here to Trelissick. It's a different way to travel to the Roadshow! Let's see what they've discovered. and a classically inspired brooch. Well, my mother passed it down to us. who passed away, I think, in the early '90s. I don't know its full history. I believe that cousin originally purchased it in Italy. -I believe it's called a micro-mosaic. It's made of extremely intricate, tiny pieces of I don't know what. I'd like to know more about it and in particular how it was made. I gather it's 19th century. that it was probably made. of jewellers who were based in Italy, called the Castellani family. They were a father and son set-up. who came into the business. within our market over here as well. would look at them for inspiration. So would this be a copy? because we've had a really good look at this piece. You've had it for years, you've had a good look at it as well, I know. And we can't find any markings on it. So it is in their style, but not necessarily by them. But it is of a quality that is really quite exceptional. which are made up of a glass compound and a paste compound. The patience, really and truly, it's quite, quite extraordinary. Of course, the subject matter is quite sorrowful, really, isn't it? and she's obviously lost somebody very close to her. which started in the Georgian period. back in those ancient times. that things like this could be made? Is it a subject matter that sort of upsets you, or...? No, it's just a bit drab, I think! And I wouldn't wear it. and colour, isn't it, with the grey and the black? the gold mount is something quite extraordinary. then I would expect it to fetch between £4,000 and £6,000. It's been stuck in a drawer! Why on earth have you bought that? if I'd have turned up at home with this! by the Danish artist Oluf Gravesen. And it's signed just down here. I didn't buy it. I actually came across it. and I happened to see it and asked if I could then take it. They said, "Yes," and then I owned it, basically. to create a piece of art? Yeah, made it all the more appealing to me. Do you know anything about it? Have you done any research? All I know is what the owner of the house told me. but basically commissioned for him to replicate an LP. and the producer obviously had the holiday home where I got it from. -Yeah, the shimmers and... Yeah. It's also a little bit sort of moon landing-like as well. to be invited to exhibit at the Copenhagen Royal Academy. And during the 1960s and '70s, his profile sort of grew. and died relatively early, sort of in his early 40s, in 1987. I think there's just so much going on here. -I mean, for me, I love it. It does exactly what you should see from the 1960s and '70s. A sort of size and monumentalism. As well as being sculptural, sort of almost tribal arty. -So I think it's got a sort of incredible amount going on. -But it isn't everybody's cup of tea. Girlfriend, yes. Likes it, loves it. This is our kind of era, I suppose. -His pieces at auction are slightly sporadically priced. you're looking at somewhere between £800 and maybe even £3,000. -Not bad for a garage find. Not bad for a garage find, not at all! and I'm wondering what your focus is, why you're here. Well, they're my father's collection. My father died three and a half years ago. and they were rapidly packed away and put back in the loft. You stopped him in his tracks! -He used to hide in the loft to look at his glass. ..crawl in there, and unwrap his glasses and admire them? That's right, yeah. Because he liked handling them, actually. I'm quite proud of the fact I've got them here all in one piece today! -and giving it a critique. So, let me examine these glasses that he bought in 1968, etc. and interesting, for various reasons. Let's do a turkey shoot first. -I know. But he liked it. -Would you like to tell him? that is actually a 20th-century copy. This is in the manner of 1750, but actually 1925. This is an "if only" glass. It's a Dutch one and thus is worth 70 quid. That's great, it can go in the glass cabinet at home now and enjoy. Go in the glass cabinet. and it's a really interesting academic glass. Let me see how much he paid. This one he bought on the 18th of January 1968.
he said that he reckoned it was worth 100. So he's actually bumping up, he's appraising his collection. So I'm illuminating what he did up in the loft. -how much he reckons they're worth now! Well, now that's 350, 250-350. So he's done OK on that one. This is a firing glass. then it sounds like cannon fire. That one today, 400 quid, thereabouts. Look at it, that stem in the light. It's a bit chippy, the foot's a bit chippy, I'm afraid. -and I'm just sorry you're not here to be with us. -Thank you. He would have loved to have met you. made of serpentine, and I thought I'd collect it. cos you've got them all! -Have you been collecting, were you bequeathed them? which is where all this stone comes from. The most southern tip of Cornwall. I started about 40 years ago collecting. and then auctions, junk shops, so on and so forth. -So, how many pieces do you have? for a group of minerals, don't you? a couple of thousand years. The Aztecs loved serpentine, the very green stuff. which they called false jade cos it looks a bit like jade. so you can see how it carves and polishes up. -And this has got lizards on it. -And it's from the Lizard. -And there is a type of serpentine called lizardite. And that's one of my favourite pieces here. you can find it readily. But these pieces are amazing examples. -I love that little font. -Do you know where that was made? It's probably made at the factory at Poltesco. And do you know when? -Yeah, I would have thought that. Most of these pieces are late-19th century. because you just cannot get that size now. -The size of the material. Do you know why it's called serpentine? I don't know why it's called serpentine. the surface of it looked like the surface of a serpent. Let's get down to value here. Because of the size of the material and the quality of it. You see, all these pieces are perfect. Those candlesticks, I think, are magnificent. They really do make an impact and I'd value those at about the same. So I think on this table we've got £2,000-£3,000. No, no, no, they're not all of this quality, I would hasten to add. from what you've told me. Is it really?! Don't tell my wife, will you, please?! or seen a silver doll. Lady Tremayne gave it to me when I was five as a toy to play with. Oh, you did the breaking, did you? but it's been in the cupboard and I don't know what it is, Bunny. Well, I'm very glad you brought it. -Now, she or he... Do you think it's a she or a he? -Well, I would say she, of course. Well, she should have a companion. -Because she's not really just a doll. So she should have a salt. What did you think it was, snuff? to dry it, didn't they? which is so unusual. It's a lot of work in there. The head is not made of silver. so basically the head screws onto the body. who worked in Birmingham and in London. and on the back it says, "Percy Edwards". made by Sampson and Mordan. probably about 1890 for this. -So it's quite old, isn't it? Anyway, have you any idea what she's worth? -I just wanted to know what she was. -The trouble is, I've got to give you an idea. -You'd better go and look for the salt, hadn't you? So, you've brought me this rather intriguing figure of Churchill. and just his head was poking above the water. So it was a question of going in, not far, and retrieving it. who was born in Czechoslovakia in 1921. He actually fled to Britain when the Germans invaded Czechoslovakia. He had kind of rather a sad life. Most of his family had died in the Holocaust. but it's actually a resin maquette. but obviously, this being the resin maquette, it's the original. I would have thought it might make 1,000-1,500 if it came up for sale. -So what's your gut instinct? The hieroglyphics on it all look right. I think it's about 1500 BC. it had been broken and glued back together. I don't think it's an accident. That released the spirit, which meant you weren't cursed. I think at auction, £1,500-ish. Really? That is a surprise. done by their kids on their fridge at home? as if one of your two boys could have sketched it yesterday. But there's a little giveaway, which is the date here, 1874. And it's a tale, really, that this gets us into, of two families. and then there's the Durrant family, which is what all this is about. Now, who is Captain Durrant? Captain Durrant, he was my grandfather's great-uncle. and also he was Governor to Prince George and Prince Edward. that have obviously really interested us in the family. we are talking about Edward VII's children. We're talking about Queen Victoria's grandchildren. and his brother, George, who went on to become George V.
-probably a bit like these two. -Very much like these two. You should have christened them Albert and George really! It's dated 1874, so he was about 10 then. You're ten, OK. So that's the sort of date that Eddy was drawing this. It's a picture, I think, of the Royal Yacht. -which I'm sure happened a lot. "Delighted at good news of dear George passing his examination. -..to visit, of course, all their aunts and uncles. Western Europe was governed by Queen Victoria's children. -This is in Durrant's hand? "and shortly after sat down to lunch." There we go. A party of around 40. It's a different world and it's a really collectable world. is going to be worth perhaps £1,500. "Ooh-ah, a letter from Queen Victoria!" -actually she was a great letter writer. -Yeah. Quite a few, then. So that's going to be in the sort of £300-£400 bracket. we're certainly talking about £5,000-£7,000. -And I know that there's more in your bag. and I think a great archive to hand on to your two boys. Family history, we are immensely proud, all immensely proud. -All of that is brilliant. and then through the Second World War. Now, that is an impressive row of medals. he's actually out there fighting. But these medals have a social story as well, don't they? -Cos these medals belonged to someone in your family. -And who was that person? in the King's Rifle Corps. He was wounded during the defence of Ladysmith in the Boer War. to buy clothes for his children. And, incredibly, you've still got the pawn ticket here. -Dated the 30th of June 1924. And he pawned them for 15 shillings. which he couldn't afford to pay, so he lost the medals. which I still have, of course. He was obviously very proud of these. -Because he had served in some amazing places. where you say he was wounded. 1914-15 Star, British war medal, victory medal. -..of 1911, for the coronation. as King George V came to the throne. which for him in those days was 18 years' unblemished service. -So he was very proud of these medals. He then went off and served in World War II. What did he do in World War II? Well, he emigrated to New Zealand in 1929.
in the Royal New Zealand Air Force. -..as an airman in World War II. -So, World War II finished. Did he claim his medals? so he didn't claim those two. And when did we get these two? My father, as next of kin, he claimed them in 1980.
as to what had happened to the rest of his medals. and an American collector responded. and he was willing to sell them to me as I was the man's grandson. -After, what, 75, 80 years...? as they should be. And they are a superb set. would be between £500 and £600. It's a very lovely set of medals. Well done in finding them. -I got it in an antiques shop in Oxford. I'm so jealous. It's so charming. -Obviously a little milking stool. -you would just tie that with a sash to your waist. Look at this. The colour here. Look at that. Now, you know what that's from. That is to me half the value of this piece of furniture. if you're right-handed and tie it to your body. -And then you do that day after day. Look at these. They're just sticks. From the hedgerow. Still got the bark on them. to go milking. It's a wonderful icon of 19th-century life. And probably English. Did you pay a lot of money for it? and I managed to get it for 175. Which is quite expensive, but it was worth it. It is expensive for a little milking stool, isn't it? you'd be very interested in it. I love it. I want to keep picking it up. This week's Enigma has to be, I think, one of our strangest yet. that it's been brought along by Ronnie Archer-Morgan. and you've brought along this intriguing little thing. I think it's an amazing object. It's from the Boscastle Witchcraft Museum. Oh, it's the witchcraft museum, is it? Can I know what's inside it? And what are these things here? They look like whelk shells. -Talk me through the options, then. Does it contain the spirit of a sailor lost at sea? might go to a wise woman. "the spirit of your loved one in a bottle to protect him." And then the person would take this home and keep it with them. Yes, keep it with them to protect a loved one's soul. You've got another option, about the weather, haven't you, Ronnie? -Well, it is a witchcraft museum. you'll know what the weather is going to be. -the less it's supposed to work. -The less magical it is. -That's rather convenient for you right now. Which is not going to help you. -and what's the last option? so you believe, so that Customs can't see you. -A form of invisibility cloak. What does everyone...? What do you think? -The weather, cos the mercury rises. You think weather cos mercury rises. So, who thinks it could be the spirit of a lost sailor? -You think it could be? -Does that appeal to your sense of...? I mean, how long ago would something like this be used? Maybe the beginning of the 20th century. I think it's got to be the weather. Don't you think that's too obvious, though? -That's why I like it. I think that's why we like it. cos because this came from a witchcraft museum. So why would a barometer type object be in a witchcraft museum? the spirit of a lost sailor. -Is it the weather thing? You were so on to it. So why have something like this than just a common-or-garden barometer? so the wise woman saw an opportunity to make some money. Yeah. Well, you've worked your magic here, Ronnie. Well, it's the first time I've won with you. All the other ones I've done with you, you've won. And I've been very happy for you. -So be happy for me. I mean, the quality of this is absolutely astounding. from Japan in the 1870s and 1880s, Western collectors were entranced. They were amazed. But where did you get it? Well, my great-grandfather went out to Japan in 1864.
and eventually formed his own company in Japan. ad things which belonged to the family then. -So, you have a whole collection of Japanese...? the family was rather large and it split up. -Well, this is a fabulous little piece. It's a very interesting time in Japanese history. You have the Meiji restoration, took over from the Shoguns. The Court moved from Edo, which is now Tokyo, back to Osaka. which, they are very tightly fitted together, but they can come apart. and supported by this toggle, which is a netsuke. but it's also reticulated and they call it a ryusa netsuke. How they perfected it, I do not know. And they would have kept their medicines in it? I think this was made for a Westerner. I don't think this was ever used. this was made for a wealthy Westerner. It was your grandfather, you said. -Well, he was obviously very successful. that could be bought at the time. it's in the region of £1,500. Good heavens! I never realised that. -I don't think it's that amazing, for the quality. I mean, look at it. It is staggering. the first thing I noticed was the name Robert Philp on the dial. as far as I can remember, all his life. which was the reason why it never ran. this clock has hardly ever run through its life. How long the mainspring had been broken, I have no idea. But he said it's in almost pristine condition. Well, that's one of the things that I particularly liked about it. is not so much the dial, but the backplate. the pendulum is the original pendulum. It's been cut off just here so the door can fit when it's snug. It looks a bit strange like that, but it's been done on purpose. -about the backplate is that it's beautifully engraved. and all sorts of things going on. But actually, that isn't particularly unusual. so we are talking about 1770-1780. So, as you pointed out, it hasn't been used very much. And you often find alterations to the pendulum and the escapement. But this one is exactly as it was made. you tend to realise there's very little been done to this. -because they never work properly. on a table clock. I mean, when are you going to need the alarm? Are you going to take this upstairs and have it in your bedroom? it's an enormous thing to carry upstairs every time, isn't it? It's strange. So, just turn it round. It's a very simple plain dial. With a bell top, bracket feet, it's quintessentially typical. But Robert Philp was well known for his musical clocks. we'd be in the hundreds of thousands of pounds, perhaps. But he was capable of making clocks of that quality. the originality, so let's put a value on it. it's got to be worth between £3,000 and £4,000. -Which I suspect is where you thought. Yes, probably. Yes. I haven't really thought about its value. I've always just simply kept it. -Well, thank you very much for bringing it in. who've got spinal and other injuries. But what's your association with the hospital? My mother as a young lady became the medical photographer there in 1954.
the disabilities of people that had been maimed in accidents. -And who is this here? -This is my mum, Margaret Bennett. In 1955, she was there, they held the Stoke Mandeville games. -And so she took a lot of photographs for that. she put herself in the position of taking the photographs for it. And here we've got an aerial view of the hospital. -By, I believe, a Dr Guttman. -Who himself had a spinal injury. -..that's gone on to the present day. And here we start the Stoke Mandeville games. August 1955. Eight years after the very first one. there he is, at the prize-giving. Table tennis. And here is the very famous Roger Bannister. For the march-past, I believe. ..it's the second most popular sporting event in the world. -And it is estimated at 1.5 billion TV viewers. Oh, it's just become phenomenal, hasn't it? for people with a can-do attitude. was involved in promoting equality and searching for opportunities. that obviously has never been published. I'm sure that people would be interested to see. -All the history is here. And it's in fantastic condition and she was a great photographer. -So, you've got all those elements. Now we have to think about price. everybody wants the gold medal. This is rarer in many ways, but it's not going to be as valuable. it would fetch certainly in excess of £1,500, maybe as much as £2,000. Wow! I had no idea it would be that sort of thing. Do you know what this is and where it comes from? It's a gold box, that's about all I know about it. My sister found it in a car-boot sale in France. she said, "Take it and see." It was made in France, in about 1785. It's got this delightful little cameo on the front here. sitting next to a flaming heart. And then another dove holding a ring above the heart. So I suggest this was probably made as a wedding present. we see it's got some marks right tucked in the corner down here. and I can't actually tell you who made it. But this is, I have to tell you, a real collector's box. Not bad for a box of bric-a-brac. No. Gosh. She'll be well pleased. and tell her it's worth £5 and you'll buy it off her. I have a test for you. Do you know the name of this pattern? Oh, it's Sandon, the family china! How wonderful. so a lot of factories call their patterns Sandon. And mostly, they are awful. But that's a really pretty one. You're trying to dig yourself out of a hole now. But anyway. I discovered this under my front doorstep in my cottage. It was up like that, in the ground, all I could see was that. And as I picked it out, it came out like that. It's half a bottle of something. and more or less, what's in it. Well, old bottles are not all that rare. But finding old bottles with their contents still in is pretty rare. and turn it to vinegar. I want to find out if this worked as a concept. where they have tested the wine and it has been found to be good. Oh, it's really rank, actually. It doesn't taste bad, but...I think it's port. It's port or red wine, it's one or the other. Or it's full of rusty old nails, and that's rust. You've been really good... You've been really game about this. It proves that not all corks worked all the time, I suspect. I wonder what we'd taste like when we're 200 years old. -It's been great. Lovely. Thank you. is grab it. Tell me about it. we'll have a hats and handbags stall. one of them being "some old handbag with a light in it". And I didn't really know what she meant. "This is more than just an ordinary handbag." with a £2.50 ticket on it. I wanted to find out a bit more about it. Well, it's brown and it's got this little diamond-shaped thing there. You know, not very inspiring so far. And my goodness, have we gone downhill since then! A light that shines down in your handbag, how clever is that? It's got somewhere for your lipstick, your perfume. Not that we do it any more, but a little place for your cigarettes. could take a patent out on. It's really well thought out. And amazingly, it was designed by a man. leathers and crocodile and various things, but this isn't. Why would you put 24-carat gold in a non-leather bag? But it's still, you know, a fantastic piece of design. And, you know, it's good vintage, vintage is in. -So I'm very glad you didn't put it on your stall. OK. Thank you so much. Very much. That's fantastic. that I would find things that came with a great maritime history. because certainly you have not let me down. -..on its way from Hamburg to New York. Heading out across the Atlantic, and then what happened? raised her up and broke her back. Her framing was broken, there was a crack across the weather deck. And the cargo shifted and she was then listing in bad weather. until that ship slipped below the waves. -Can you just quickly identify who is who? wearing the cap, is Captain Dan Parker. He was the master of the salvage tug, the Turmoil. that's the first mate of the Turmoil, Ken Dancy. who's seen pictured there in the centre. -And the tug came from not a million miles away, did it? We're looking right down the river Fal. and they would go out to bring the salvage back to port. It slipped its line or...? They got a line on it, bad weather hit them again. and there was no way she was ever going to make it back to port. that she had listed so far over that she was about to sink. they were healthy and happy. and he was given a ticker-tape parade welcome. This had become such an international media event. as was the captain as well. that captured the public imagination. a conspiracy theory about, why was there so much interest in the cargo? I mean, it was meant to be pig iron and cocoa, or something like that. for the first American atomic submarine, the Nautilus. and how do they relate to you and your family? is Jock Drennan, and he's my grandfather. in the world, the Chainlocker in Falmouth. Ken Dancy, the family friend that he was, brought both of these items in. He'd been given the life jacket by Captain Carlson. my grandad had them cased and put them on the wall. After my grandfather died, his son Bob, my uncle Bob took over the pub. she sold the pub and its contents. in a local auction room at St Day, a few miles down the road. so I just had to go and buy them and bring them back in. I think you'll all agree that is an amazing story. And Hollywood couldn't have made a better one out of it. The conspiracy theory sort of adds speculation to it all. -I mean, that was truly amazing. certainly between £10,000 and £15,000. that Jon Baddeley was talking about, back in the early '50s. and it's been largely forgotten now. we can bring these stories back to life. From Trelissick House and Gardens, until next time, bye-bye.